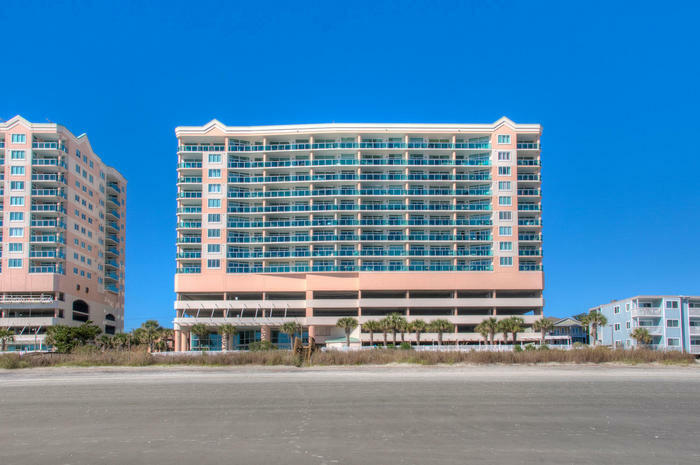 This North Myrtle Beach resort boasts a second pool deck that is conveniently located on the sixth floor. This pool deck is ideal for kids as it features a kiddie pool, lazy river and whirlpool. And for the adults, indulge in the hot tub that is found on this pool deck at Crescent Keyes. Explore this North Myrtle Beach resort even further and discover an indoor swimming pool that offers a nice respite from the warm sunshine during your North Myrtle Beach vacation. Crescent Keyes has a fitness center on site. You just might be inclined to visit this amenity because it has sweeping views of the pool deck and Atlantic Ocean. The scenery alone makes your workout seem easier. It is easy to daydream when you are on the weight and cardio machines and can look out to the turquoise waters of the ocean and the activity on the oceanfront pool deck. Seeing people walking around in bathing suits might be the incentive you need to get in a few more minutes on the treadmill during your North Myrtle Beach vacation at Crescent Keyes. There is a wide variety of North Myrtle Beach condominiums at Crescent Keyes. Ranging in size from one-bedroom and one-bath condominiums that sleep six people to four-bedroom, three-bath vacation rentals that accommodate 12, there is a floor plan that best suits your family’s needs. Some furnishings and amenities are found in all of these North Myrtle rentals, such as high-speed Internet access, a kitchen with a dishwasher and microwave, and a DVD player. There is also a washing machine and clothes dryer in each of these beautifully decorated condominiums in North Myrtle Beach, South Carolina. Each vacation condominium also has an ocean view balcony. Most of the condos rentals at Crescent Keyes have a direct oceanfront view. Crescent Keyes is a seaside palace and your family is invited to live royally for the duration of your North Myrtle Beach vacation. Feast your eyes on Crescent Keyes and then feast your eyes on all the amazing restaurants that are in close proximity to this North Myrtle Beach resort. Dine on seafood, steaks and sushi in North Myrtle Beach, South Carolina. Discover the tradition of visiting a North Myrtle Beach area dinner theatre where you catch a fantastic show while eating a four-course feast. The kids will love that you eat with your hands! Finding time for your family during a North Myrtle Beach vacation such as this is easy. Play catch on the beachfront and board games on your ocean view balcony. Stay up late and watch your family’s favorite movie as all of the condos at Crescent Keyes are furnished with a DVD player. North Myrtle Beach is rich with memories and you are invited to create your own. Take shag dance lessons in a popular beach club. Enjoy a six-man banana boat ride across the ocean’s waves. Play 18 holes of championship golf in Myrtle Beach. Hire a fishing guide and explore the nearby inlet. Rent a two-man kayak and paddle around the beautiful salt marsh. Revisit your childhood and turn cartwheels on the white sandy beaches. Build sand castles that are adorned with seashells. Play miniature golf and go for a hole-in-one! From oceanside arcades and fishing piers to beachwear stores and ice cream shops, the area is brimming with fascinating, fun things to during your North Myrtle Beach vacation. All of these North Myrtle Beach amusements and Myrtle Beach attractions provide for your Southern comfort.